Download this white paper to see how global recruitment technology helps organizations efficiently manage the complete hiring cycle. Attracting the right professionals that drive your business forward is crucial and, in today’s world, the first step to recruiting talent is establishing an online connection. 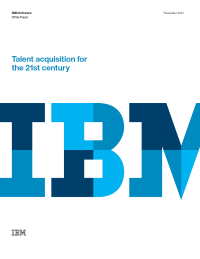 In fact, over half of job seekers used mobile devices in past or current job searches, according to an IBM Smarter Workforce study. There is a growing number of HR recruiters deploying leading mobile and social technologies to mine the large volume of applications and meet evolving business needs.